Weapons research may yet produce a true spaceplane. THE HYPERSONIC REALM is out there, just beyond our reach, above Mach 5. And so it has remained for decades. We’ve touched it briefly, even built vehicles—notably the X-15 and the space shuttle—capable of traveling at hypersonic speeds for short periods as they dive down from the edge of space. Yet we always seem “10 years away” from a true aerospace plane that can cruise long distances through the atmosphere at many times the speed of sound without burning up. It never even came close. And it took the field of hypersonic research years to recover from the letdown. After Reagan’s State of the Union speech, the media immediately branded the National Aero-Space Plane “the Orient Express.” The program was canceled in 1994, never having emerged from the research phase. So forget about the Orient Express for now. Think hypersonic weapons—Mach 6 missiles, more than six times as fast as today’s cruise missiles. Launched from a distance, such weapons could destroy hardened targets with their high-speed impact alone. The Pentagon wants the capability to reach any place on Earth—say a terrorist’s temporary hideout—within two hours. And unlike an intercontinental ballistic missile, a hypersonic missile could change course in flight or even abort its mission. That vision has spawned a mini-boom in hypersonic research—this time without the hype. Dozens of projects are under way worldwide, several of which will lead to test flights within the next few years. 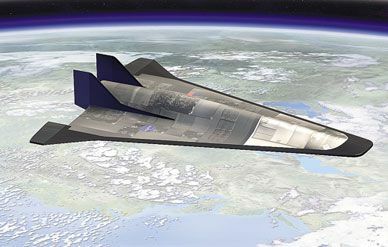 A trio of inter-related U.S. military projects—HiFire, X-51A, and FALCON—are intended to solve different pieces of the hypersonic puzzle, from propulsion to aerodynamics to the peculiar physics of hypersonic flight. THE CURRENT BOOM began in the summer of 2002, with researchers at the University of Queensland in Australia launching a small hypersonic test vehicle on top of a sounding rocket. For the first time, the experiment, called HyShot, proved that a key component of hypersonic propulsion, the scramjet, or supersonic combustion ramjet, could work in the atmosphere and not just in wind tunnels (see “Outback Scramjet,” Oct./Nov. 2002). By scooping oxygen from the atmosphere as they fly, scramjets liberate hypersonic vehicles from the need to carry heavy tanks of oxidizer for combustion. Since HyShot’s 2002 launch, international researchers have successfully flown air-breathing engines three times, reaching speeds just short of Mach 10. As a hypersonics engineer at NASA for 30 years, Pittman has been through flush times and lean times. “Living through it is frustrating,” he says. “It’s a cycle, and you just have to tough it out.” Pittman worked on the NASP as well as the X-43, which was part of a larger NASA program called Hyper-X. Ironically, around the time the X-43 succeeded, the agency’s aeronautics budget got slashed, one reason NASA now finds itself playing a supporting role to the Pentagon. Which is not to say the space agency’s contributions are insignificant. This fall NASA will launch a small experiment on a commercial sounding rocket from NASA’s Wallops Flight Facility, off Virginia’s eastern shore. Called HyBoLT, for Hypersonic Boundary Layer Transition, the wedge-shaped payload should provide valuable data on the fundamental physics of high-Mach flight. The HyBoLT test article, which looks like the flat tip of a screwdriver, will be launched on its suborbital rocket to an altitude of 250 miles, while instruments record temperatures and pressures on different parts of the surface. It’s a modest experiment—the kind of basic data collection that supports the sexier test flight programs. Not far from Pittman’s office at NASA’s Langley Research Center in Virginia, testing is under way for one of those high-profile programs—the X-51A scramjet demonstrator, a $240 million collaboration between the Defense Advanced Research Projects Agency (DARPA) and the Air Force. A scramjet engine for the vehicle has been fired dozens of times at Langley’s 8-Foot High Temperature Tunnel. With four test flights over the Pacific Ocean slated to begin in 2009, the X-51A will ultimately attempt record-breaking engine burns lasting five minutes, which should propel the craft to about Mach 7. Like the X-43, the X-51A is a wave rider. After being boosted to high altitude, the vehicle will light its engine and surf its own shock wave, compressing the air in front of it and lowering drag. Though the immediate goal is to flight test a propulsion system for a superfast missile, the project received the X-plane designation in recognition of its potential to advance the field of hypersonics generally. For Mark Lewis, the X-51A is all about the scramjet. “We want to see a scramjet engine work for more than 10 or 11 seconds,” he says, referring to the burn times of the two Hyper-X flights. Engine burns of several minutes would demonstrate to skeptics that long-duration scramjet-propelled flight is feasible.